Some days ya do what ya gotta do..
Every picture tells a story don’t it…. I blew up my truck and needed a counter-top oven more than dignity, so expedience ruled the day.. which it usually does. 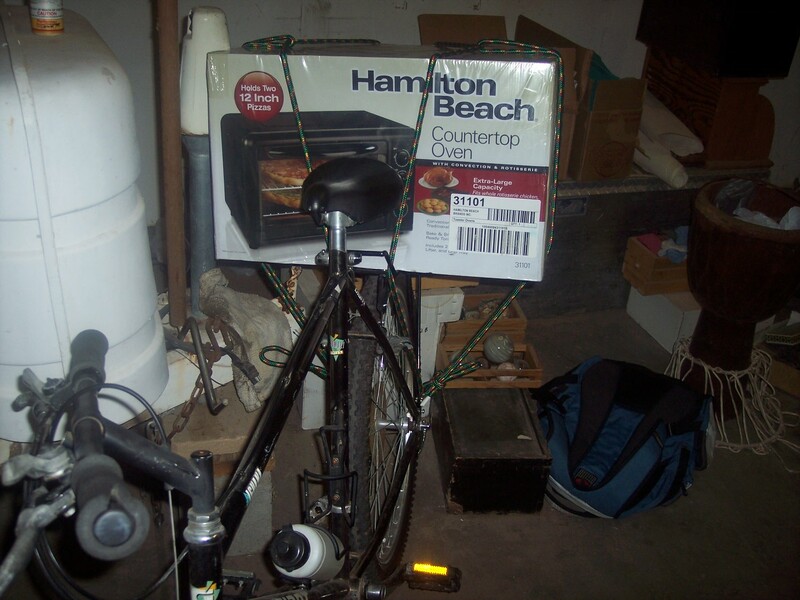 The adventure was tying the oven to the bike, while shoppers made a wide path around me avoiding eye contact. Which I found amusing. Apparently there were implications of homelessness or insanity in the activity… But one would think since it was an oven, I might have the resources to plug it in somewhere, other than a cactus. People who knew me laughed or smiled since my quirks are fairly well known and everything is under control, albeit odd given my methods of problem solving.. But problem solving is the key no? Besides the oven has a rotisserie built in, aside from a broil and convection function. So ya do what ya gotta do. No longing, wishing or unfulfilled desires..it’s all about “how does this thing get done”. And that’s kind of that… faint heart never won fair anything, except maybe a pace-maker. I decided I want a butcher block table and another industrial type bakers rack along with the usual bulk bottles of propane for my regular oven. But as noted the beloved truck is indisposed with a cracked head and in various pieces… Swell, fine that’s life etc. Everything I do is within ten miles, so why not haul a trailer behind the bike? Aside from the fact a bicycle cargo trailer costs around $700 and that’s not gonna happen.. But building a bike trailer isn’t out of the question..